In Kabbalah, from the Zohar and the writings of the Arizal, the year 5736 (1976) is an important year. This is the year from which the preparations began above for the end of darkness, the redemption, and the Messianic era. Recall the story of Joseph. He was living in the affection of his father and living in relative tranquility. Then, in short succession, he was sold as a slave, transferred to Egypt, and after he refused the advances of Potifar's wife, he was tossed into Pharoah's prison. He was in languishing prison and with the help of God, he correctly interpreted the dream of the minister of the cupbearers, who was also in prison. Joseph told him that he would be restored to his post. And this is exactly what happened. 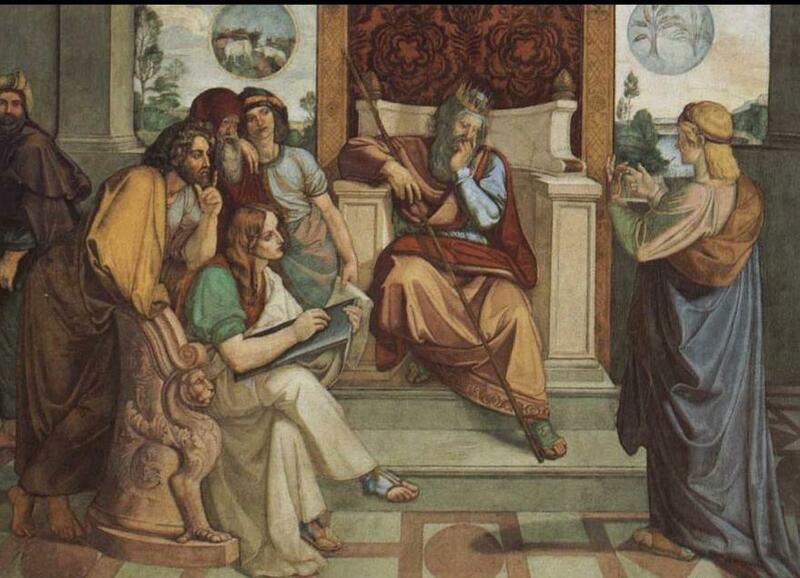 The Torah says that exactly two years later Pharaoh had his dream that none of his advisors could interpret. Who set the limit? Midrash Rabbah tells us that it was God who set the limit. God is orchestrating the events. What were these two years. They were the two additional years that Joseph was in jail because he said to the minister of the cupbearers two years before, Mention me to Pharaoh (Genesis 41:1). This statement to the minister indicated that Joseph was relying on people instead of God to get him out of prison. For him this act showed a loss of faith. The imprisonment of Joseph can be likened to the exile of the Jewish people. This dream of Pharaoh, followed by Joseph's impressive interpretation of the dream and then Joseph's elevation to the second highest position in the land of Egypt, can be likened to the end of the exile. The end of the exile is the beginning of the Messianic era. The Arizal, Rabbi Isaac Luria, writing in the 1500's, in his book Likutey Torah, page 48, states that this verse indicates to the beginning of the time of redemption, the Messianic era. He reasons as follows. One year, is to the nearest integer, 365 days, which in Hebrew gematria can be represented as שסה. Two years is then 730 days. The Ari writes שסה שסה. As this consitutes 6 letters he adds 6 to 730 to get 736. The Zohar in commenting on this passage of at the end of two years, refers to what it regards as a parallel passage in Psalms. The phrase the Lord bearing our burden is likened to the Lord bearing our exile. The word here translated as Lord in the text is אדני. This prompts the Ari to write that when the name of God אדני is written out in full, אלפ דלת נונ יוד, the gematria is 671. And when this is added to the gematria of אדני which is 65, the result is also 736. Which thirty days are these? These are the 30 days that the Israelites mourned the death of Moses. After this they left the desert and entered the Land of Israel. In the first case, it is the imprisonment of Joseph that precedes his elevation to the second highest administrative post in Egypt. In the second case, it is the darkness that precedes the light. In the third case, it is the desert that precedes the Land of Israel. Each can be likened to the exile that precedes the era of the Messiah. This time period is called the End of Days. The Vilna Gaon states in his many books that at the time of redemption there will be many secrets of Torah that will be revealed. One of these secrets is Torah Codes. It is interesting to note that the gematria of קודי התורה, Codes of the Torah, is 736. This 736 is the 736 of the year 5736 because redemption is known to come in the sixth millennium. We use for our key words End of Days as spelled in Daniel 12:13. 5736, in 5736, 736, or in 736, On High, and the key word Code, using the Hebrew קוד. The best table used the key word 5736. With expected number of ELSs set to 10, the probability that a text from the ELS random placement text population would produce a table as small as the one produced by the Torah text is 6.5/100,000. The cylinder size produced by the search is 10135. With expected number of ELSs set to 10, the probability that a text from the ELS random placement text population would produce a table as small as the one produced by the Torah text is 6.5/100,000. We repeated the experiment using for our key words End of Days as spelled in Daniel 12:13. 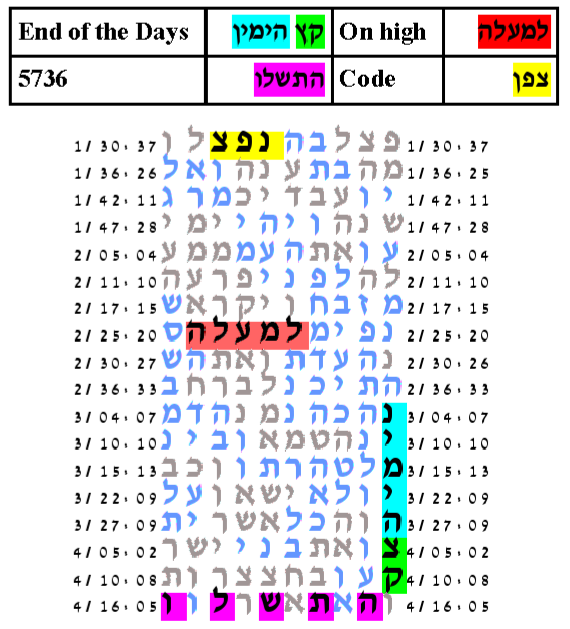 5736, in 5736, 736, or in 736, On High, and the key word Code using the Hebrew צפן. The best table used the key word 5736. With expected number of ELSs set to 10, the probability that a text from the ELS random placement text population would produce a table as small as the one produced by the Torah text is 4.5/100,000. The cylinder size produced by the search is 10135. With expected number of ELSs set to 10, the probability that a text from the ELS random placement text population would produce a table as small as the one produced by the Torah text is 4.5/100,000. 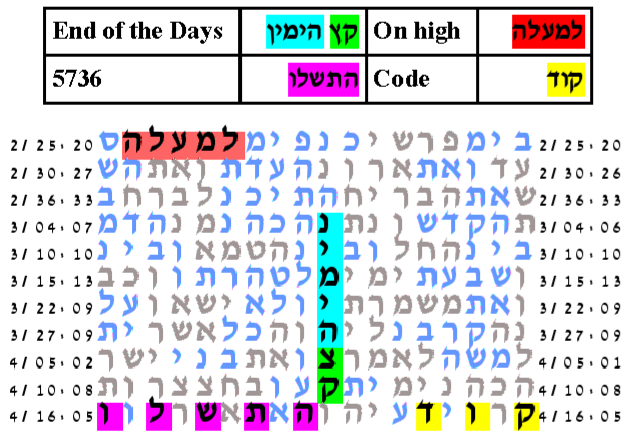 For our third table, we use a similar set of key words End of Days, spelled as in the Torah, and one of 5736, in 5736, 736, or in 736. and the key words Code,using the Hebrew קוד, and Light. We had an optional key word On High, but its ELSs did not make a compact meeting with the other key words. The best table used the key word in 5736. With expected number of ELSs set to 100, the probability that a text from the ELS random placement text population would produce a table as small as the one produced by the Torah text is 4.5/1,000. The cylinder size produced by the search is 1049. With expected number of ELSs set to 100, the probability that a text from the ELS random placement text population would produce a table as small as the one produced by the Torah text is 4.5/1,000.